Mohair is the fleece that is sheared off the Angora Goat twice a year. 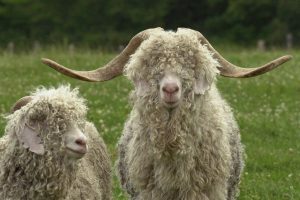 Angora goats originally came from Turkey where the mohair fiber was the prized reserve of the sultans. Mohair is known as the “Diamond Fibre” for its lustre, strength and durability. Unlike sheep’s wool, mohair fibers are smooth and don’t trap bacteria which cause smells. So mohair is ideal for socks. It does not conduct heat so it is a great insulator. Mohair can be twisted and bent without damage to the fiber. It is the most durable of the animal fibers. Mohair is so comfortable, the smooth fibers of Mohair do not irritate the skin, especially for people who are sensitive to wool. Mohair easily absorbs and releases moisture, moving perspiration away from the skin. It is comfortable to wear in the winter and summer. Mohair is also unparalleled in its retention of dye color and is amenable to natural dyes as well.